Dear Little Brother, with immense joy, we join again in consciousness, to share our souls with yours. As the journey has been unfolding, bringing forth many beneficial fruits, we shall carry on with you. When we first asked you to transcribe in words our message, less than three years ago, you had no idea how fast and far the ripples would reach, so you have been astonished with the progress of the process. The first two books we asked you to write gave birth to the series entitled ‘The Sasquatch Message to Humanity’, which keeps reaching a growing international audience, responding with the best feedback. For the third book, we asked you to open the portal for other Human ambassadors to us Sasquatch, with whom we communicate and through whom we transmit spiritual teachings for your Human evolution. That opened portal has created a powerful channel, confirming the gifts and vocation of the co-authors. Now this series has a life of its own, with already enough material written by the dozen of collaborators for a fourth book, to follow Book 3 on its way, with added inspiration to come through more channels. We thank Kelly for her dedicated editing work manifesting these teachings in books, and our long time friend and ally Kewaunee, a pioneer ambassador to us, for publishing these inspired messages fetched from the ancient knowledge of our Sasquatch People, your closest relative and caring Elder Brother. The Sasquatch Message to Humanity book series has become an ongoing long term collective project. This is how we had planned, as we have called you for opening portals, for the great cosmic disclosure. This was the next step after gathering those among your people who know us and communicate with us. And we have accomplished all this process under Divine guidance, as part of a greater cosmic plan. Need we to remind of the four promises we made you in the spring 2015, that have all been fulfilled? That our message would find resonance far and wide with many, that we would be with you and teach you on your journeys, that you would meet a growing number of your people who know us Sasquatch, and that we would gather you from around the world in active growing communities for the disclosure. Now, the third annual international Psychic Sasquatch Spiritual Retreat is approaching, and many other circles are opening to our teachings, inviting our ambassadors to speak, in events as well as online. Those portals are opened, they have keepers watching over them, who keep them as inviting channels. We will continue to work with them, disclosing truth through the combined actions of our ambassadors. As you still continue on this journey, we ask you to keep opening portals, bridging planes in resonance. This is why we asked you this year to widen your vision and start a new global network focused on disclosure, promoting the development of peaceful interspecies communication and spiritual relations. The Sasquatch Close Encounter Network for Interspecies Communication (SCENIC) is more than just another web platform; it is a living vision, a growing movement, building universal bridges connecting species. When we gave you this vision this winter, standing with you in the cedars, we also showed you our joy. You had asked us for guidance to know how to carry on your mission to the next level, so we answered. You have become accustomed to our frequent manifestations in ways you cannot always report at large. 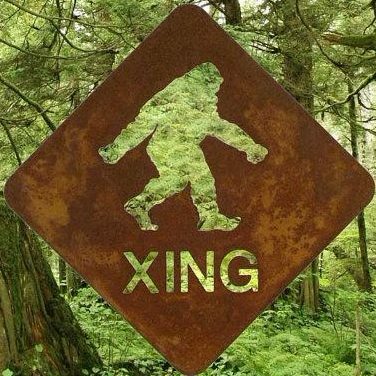 The widening of the community of Sasquatch friends, contactees and communicators gives a greater significance to your own experience, which does not need to be explained anymore to have credibility. The accounts of a fast growing number of experiencers confirm that we have been reaching out to you. The multiple interdimensional manifestations we have been teaching you with, that some would call paranormal phenomena, for lack of a better understanding of them, need not to be described in details. Only the teachings and understanding that can be useful and beneficial for seekers should be shared. This is why we are asking you now to write this new book, addressed to the spiritualists and shamans. We will make use of the word ‘shaman’, from the ancient Tungus language, meaning ‘Spirit person’ or ‘Light person’, referring to spiritually gifted people who could bridge the Spirit world with the Humans. In the most ancient Siberian tribes, only women were called shaman, but later gifted men were also. The word is related to the Sanskrit form ‘shramana’, meaning an ascetic mystic, also spiritually gifted. Although the word ‘shaman’ has been turned into a generic term through anthropology, to designate all spiritually gifted people in tribal cultures, each culture has its own names, roles and functions for them. Some are seers who can see distant places, visionaries who can see past or future events, clairvoyants who see into other dimensions, interpreters of dreams, story tellers, keepers of archives and knowledge, wisdom keepers, guardians of ancestral heritage and prophecies, healers of all types of arts, using stone people, plant medicines, animal spirits, ancestors power or chants in their healing ceremonies, repellers of spells, cleansers of sites and of people from unwelcomed entities, teachers of unity consciousness, interdimensional travelers, or interspecies communicators, learning with the Sasquatch and Star Elders. Regardless of their gifts or the cultures they originate from or have learned with, we call them shamans. In the Indigenous traditions of this continent some call North America, that we will name Turtle Island, as well as in the tribal stories of Siberia and other ancient shamanic cultures of the world, it has always been the shamans or medicine people, the spiritually gifted ones, who were appointed to communicate with our Sasquatch People and with our Star Elders. The rest of the tribes were generally avoiding us. This is because our interdimensional abilities are impressive for the common people unprepared for it. Likewise, it is our shamans and medicine Elders among us Sasquatch who reach out and teach Humans. The shamans would often stay on the outskirts of communities or outside the villages, where Sasquatch ambassadors could go visit and teach them. Some tribal cultures have honored us in their ceremonies, for this we are grateful and have kept showing our presences and signs of our friendship to them, mostly through their shamans. Apart from the first hand accounts of contactees, shamanic cultures are the best sources of knowledge about non-Human intelligence, because they have kept their ancestral connection with Nature spirits, with us Sasquatch and with our Star Elders, not only through many generations of interaction, but also through their advanced understanding of the Spirit world and of the muldimensional Omniverse we live in, being an integral part of its intricate fabrics, beyond physical. For those who choose to stay anchored into the outdated materialistic paradigm, proven incomplete, incorrect and backward, through quantum physics and through a well demonstrated array from multiple studies of paranormal and psychic factors, this book is certainly of no interest for deniers of spirituality. It is meant for the spiritualists, the shamans, the healers who, on their sacred journey, wish to learn and work with us, your interdimensional Sasquatch and Star Elders, assisting your consciousness evolution. The last generation of those great Indigenous wisdom keepers, who had preserved the knowledge from precolonial days, is rapidly passing to the Spirit world, taking with them treasures of ancient secrets. This higher level of advanced shamanism with mastering of miraculous deeds has practically vanished. This is why, at this crucial time of your collective destiny, we come forward to your help and reach out. We wish to teach you about the most important subjects leading towards the next quantum leap of your collective consciousness, being the understanding of interdimensionality and non-Human intelligence. What you are is infinite consciousness incarnated into this garment of flesh you wear and carry around. It is a wonderful biological vehicle that allows you to interact into the 4D linear space-time continuum, the physical realm, the plane of evolution through experience and transformation, on a home-planet. Yet, the restrictions, survival needs and limitations of this physical dimension often cloak our true Self. The way of the spiritualist is to always remember we are the consciousness or spirit, behind the mask; that the illusion of appearances is a mere matter of physical laws, that can be bent, twisted or bypassed; that this world surrounding us is a hollographic projection emanating from Universal Consciousness, an interactive theater in which we have a role to play, and the power to write the script of our timeline. For the spiritualist, it is all Spirit, like the quantum physicist discovering everything is consciousness. We shall share practices that can help in the development of your psychic abilities and healing powers. We wish to teach you how to dive from the light into the dark, and travel from the dark into the light, without any harm or fear; to face the darkness and dispell the harmful influences harassing this Earth; to acknowledge and embrace your own shadow, your ego twin, and make it an ally of your higher Self; to heal the lingering traumas, alleviate the souls from their pains, release the captives from karmic jails, cleanse ancient sites from ancestral erring ghosts, reactivate healing energy vortices in places of power. We shall deliver to you ancient secrets and univeral laws about free energy, consciousness technology, and interdimensional devices that can help to realign your collective consciousness with the Cosmos. We shall reveal useful insights on how to empower the Earth’s natural energy grid with star alignments. We shall provide tools, exercises and ceremonies for the planetary healers and intergalactic contactors. The greater purpose of this message is to empower the Human spiritual seekers, knowers and leaders into connecting in a global peaceful consciousness, setting the basis of a planetary spiritual civilization that will focus on healing and balance and reach the level of readiness for interdimensional star contact. We wish to help Humanity, by showing you the way to higher collective consciousness and civilization, but we are well aware that the ultimate choice remains yours, concerning your own path and destiny. Since no single book can contain all the knowledge and wisdom necessary for Humanity, we will keep channeling our messages through a growing number of channels as part of the great cosmic disclosure. As for you, we ask you to do your part: transcribe what knowledge we impart to you in this new book. You know by now, we are grateful for your work, as you are for our continued teachings and guidance. So let us proceed with the transcription of this new series of messages for the spiritualists and shamans. Thank you for your encouraging comments Ellen. The Elders have inspired me to start doing daily ceremonies focused on gathering the shamans, medicine workers and healers in a stronger global circle. At the same time, this starts a new cycle of channeling sessions for me for the writing of this new book, started just last night. As for the first two books of the Sasquatch Message to Humanity series, I will make every chapter available for free online reading, as they get written, before the book is completed and turned into printed and e-copies for sale. Thanks and blessings.